With Lets Go Surfing, you’ll easily learn to ride a surfboard at the world-famous Bondi Beach in Sydney. Instructors will also show you how to read surf conditions. Lets Go Surfing has surfing and stand-up paddle-boarding lessons for all skill levels. You’ll be standing on a board in no time with Lets Go Surfing, which also offer lessons in Byron Bay on the NSW North Coast. Lessons are available seven days a week. Times will vary depending on tides. You’ll be notified of times once you’ve made a reservation. Lets Go Surfing also offer the Discover Bondi Tour, which allows you to spend time with a lifesaver, learn how surf lifesaving began and go inside Australia’s oldest surf lifesaving club. You’ll also have the opportunity to have a photo taken with a lifesaver. The Get Wet tour is 1.5 hours and includes the Discover Bondi Tour along with a guided swim between the red and yellow flags. UV rash vests, wetsuits and sunblock are provided. Both tours are available in English, Mandarin, French, Spanish, Portuguese and Korean. 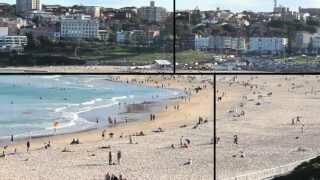 Bondi Beach is about 40 minutes from Circular Quay by bus.